For years, Republicans in Congress have been eyeing an overhaul of the federal workforce — by reducing the number of workers and curtailing benefits and pay while making it easier to fire bad employees. Now, with a president-elect who has promised to do much the same, 2017 could be the best time in recent memory to make sweeping changes affecting those who work for the bureaucracy. One major plan is being readied by Rep. Jason Chaffetz, the chairman of the House Oversight and Government Reform Committee. The Utah Republican calls it “high on our agenda.” While details remain sketchy, it would likely mean big changes to the generous retirement benefits given federal workers, mainly by looking to shift new employees from a defined benefit into a market-based 401(k). He is also interested in making it easier to fire workers who perform badly and wants to reduce the federal civilian workforce, which currently numbers 2.1 million employees, not including U.S. 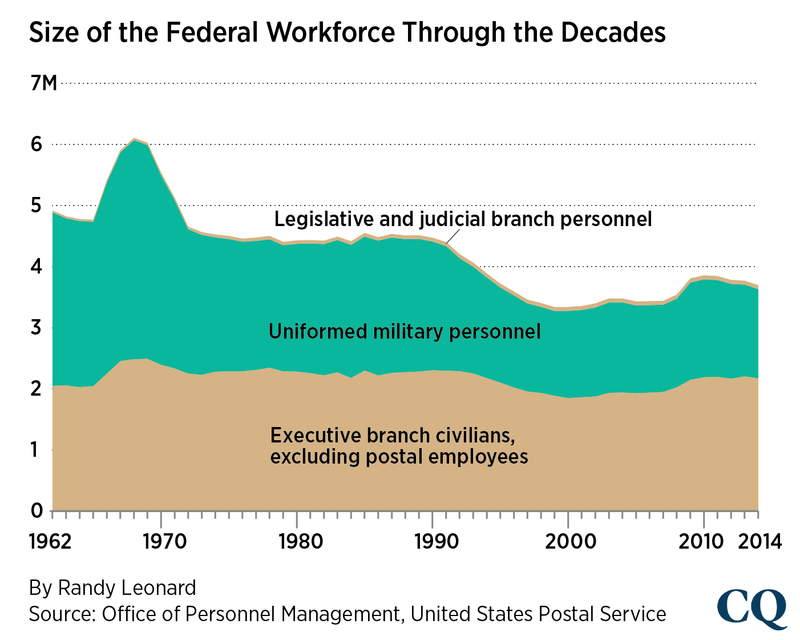 Postal Service employees. “We’ve got to deal with budget realities, and while we have good federal workers, we have too many of them,” he told Roll Call. The House budget resolution also called for an eventual phaseout of the defined benefit pension while increasing employee contributions to 6.35 percent, among other benefit changes. The House plan would have saved roughly $281 billion over 10 years, according to figures compiled by Government Executive. Republicans would likely exempt those employees deemed essential for national security, or roughly 50 percent of the total workforce, according to some experts. Chaffetz said he’d seek to increase the number of Secret Service employees. If President-elect Donald Trump wants to institute a hiring freeze, as he has promised, he can do so via executive order or other actions. Chaffetz has yet to settle on a firm formula on how to achieve reductions, but he said some sort of attrition plan will likely be part of the bill. “I haven’t locked down on a formula, but I think an attrition formula is a wise way to go,” he said. The congressman shepherding such legislation during its early stages will be an intriguing player to watch. North Carolina GOP Rep. Mark Meadows, the chairman of the Government Operations subcommittee, will also be the head of the hard-right House Freedom Caucus next year. In 2015, he was stripped of his chairmanship by Chaffetz during a fight over the speakership of John A. Boehner — though Chaffetz ultimately relented and reinstated Meadows. That same year, Meadows embarked on a “listening tour” of federal agencies, and later offered an apology to federal workers whom he said were being unfairly scapegoated. In an interview, Meadows said that he was preparing to work on “meaningful reform that works well with accountability and efficiency” and said the complexity of the issues involved means that a bill would likely not be out during the early part of 2017. “It’s not only a blunt ax, it’s a rusty, damaging ax,” Light said. The main problem he sees with most attrition proposals is that they offer no safeguard to prevent a stampede out the door of the most experienced and highest-performing workers. Democratic Sen. Benjamin L. Cardin of Maryland, where the Food and Drug Administration, National Institutes of Health and National Security Agency are located, gave no indication that Democrats are ready to compromise. “The best way to achieve this is to come to the negotiating table with all stakeholders. We may not agree on everything, but if we start with the areas of agreement, I am confident that we can make continuous improvements to the functionality of the federal workforce,” Johnson said. The Oklahoma Republican said his committee is focused on ways to overhaul the Office of Personnel Management and its perpetual backlog of processing retirement applications, and speeding up the hiring process, among other issues.